Figure 1. 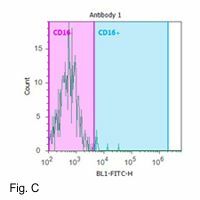 Flow cytometric gating strategy for determination of CD 16 (FcγRIIIA-158) V/F polymorphism. 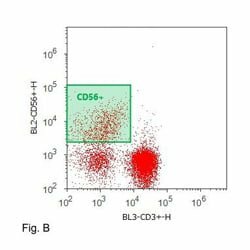 (a, b): NK cells are gated from PBMC and CD 56+ CD3-region. (c – h): CD 16 fluorescence of NK cells from three individuals genotyped as FcγRIIIA-158 F /F (c, f), V/F (d, g), and V/V (e, h). 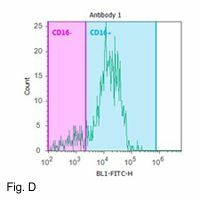 NK cells were labeled with CD 16 antibody 1 or antibody 2 and counter stained with FITC conjugated Goat anti Mouse antibodies. 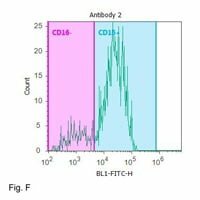 The MFI ratios of antibody 1/2 were F/F: c/f < 0.04, V/F: d/g = 0.42, and V/V: e/h = 0.83, respectively. Obtaining fresh blood samples from random donors. 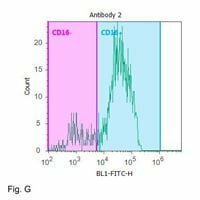 Isolate PBMC’s from blood samples. Stain cells with antibodies for V and V/F allele visualization. Determine immunofluorescence ratio for antibody 1 and antibody 2 to determine V/V, V/F or F/F phenotype by Flow cytometer. Numbers of donors to be tested. 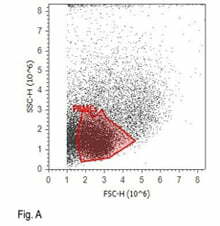 10 ml of Blood samples or 1ml of PBMC cells for each donor ( 1x 106 cells/ml). All additional supplies would be procured by Cell Technology, and billed to the client at cost. Please submit a detailed description of your project.